Care homes throughout the UK have been using our Remember-I’m-Me Care Charts since 2010, making a significant and beneficial impact on the quality of care they provide, offering peace of mind to families, and impressing the inspectors. Originally developed for people living at home, we are finding care homes like this option as an alternative to our laminated wall charts. Mycarematters is an online service where a person’s needs and preferences can be stored, enabling hospital staff to provide person-centred care from the minute they are admitted. A person’s Mycarematters profile can be viewed online or printed out from any internet-linked device. In addition to having residents’ paperwork prepared for a hospital visit you may choose to use your residents’ Mycarematters profiles in their rooms, easily updating them online. We have a variety of ways to display a person’s Mycarematters profile, including the Twist-N-View Image. The cost is just £5 per annum per resident, but we are offering those homes already using our charts the opportunity to use it free for the first year. The same offer applies to the purchase of any of the Display Options available to display a person’s Mycarematters profile. We are developing a library of informative articles as well as links to other products, covering numerous aspects of care home life with the intention of helping you improve the quality of life of staff and those they are caring for. Have you seen our Daily Prompt Posters? 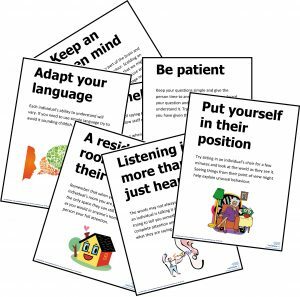 The idea behind these fun and eye-catching set of posters is to reinforce messages that are likely already to have been discussed in training. Select a different poster every week or across a number of shifts and give your staff an opportunity to feed back what impact it has had on their care.